This time of year I’m really trying watch what I eat…and not just as I’m eating it. 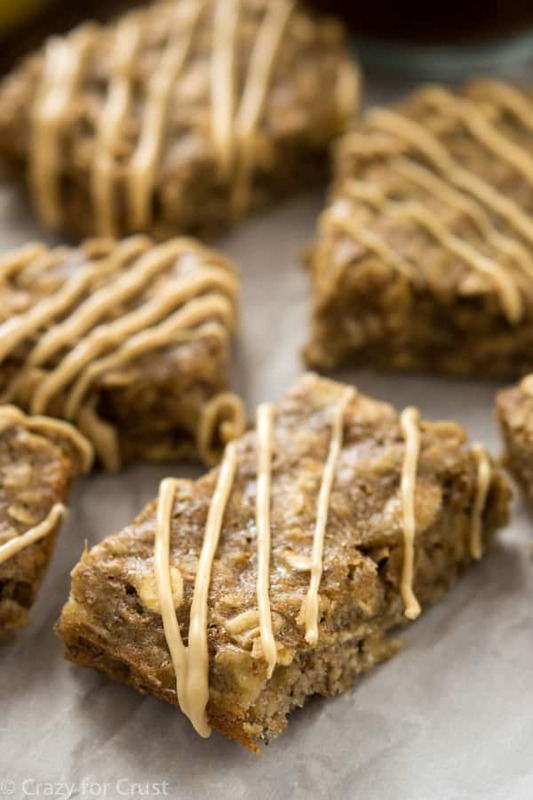 These Banana Breakfast Bars are helping me do that! I don’t believe in the word “diet”. I’ve done so many diets and they all fail, which ultimately leads me to feeling bad about myself. For me it’s about lifestyle: exercise, portion control, making good choices, and satisfying cravings (within reason). Some people are able to cut full food groups out of their diet with seemingly no problems. My husband has done Whole 30 or some variation off an on for almost a year now. I know some people that give up carbs or dairy or wheat or whatever and are perfectly happy. Others can do juice cleanses and fasts to reset their bodies. I’m not one of those people. I’ve tried to say “I won’t eat dessert” or “I won’t drink during the week.” Those fail within 2 days, and then I’m angry at myself…again. And giving up carbs? No one wants that. My family encourages me to eat carbs. Carb-free Dorothy is not a very nice person. Also? Why live if you can’t have a cookie now and again? I don’t understand why someone would want to live a life without what they love. Everything in moderation is how I like to live. Unfortunately, my definition of moderation has changed over the last few months. Ahem. Therefore, as we get into a new year and the inevitable weight loss and resolutions hit, I’m going to resolve to cut myself some slack. I’m going to try and eat more fruits and vegetables. I’m going to try and eat more protein. And I’m going to try and limit how many desserts I have in a day (hard, with this job). But the one thing I can’t limit? My after workout snack. And breakfast. I need breakfast, and after my workout I need to eat. That’s where these breakfast bars come in. For a long time I bought breakfast bars at the grocery store. Then I realized that I was paying $4.50 for 5 bars or some ridiculous amount, and the bars weren’t even that good. Also? They’re filled with ingredients I don’t recognize. I’m much more satisfied if I eat something I like, that’s homemade, than something packaged. 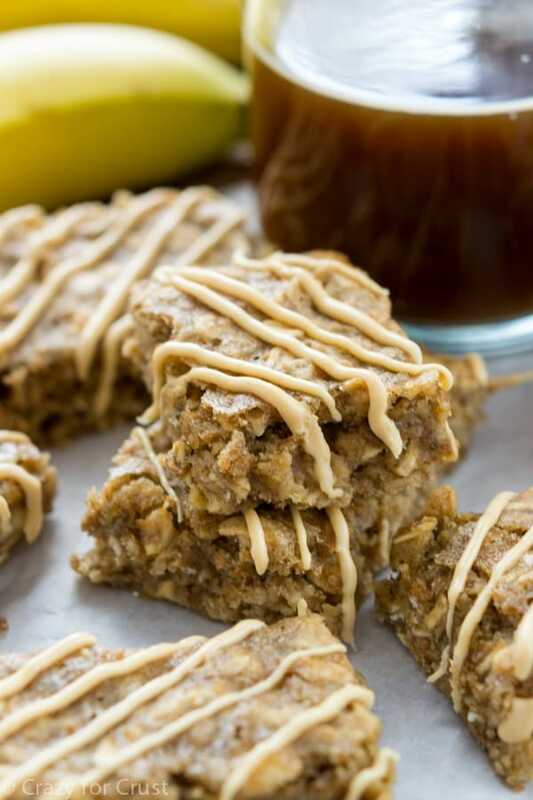 Banana Breakfast Bars are an easy breakfast or snack, made with real ingredients and flavor. 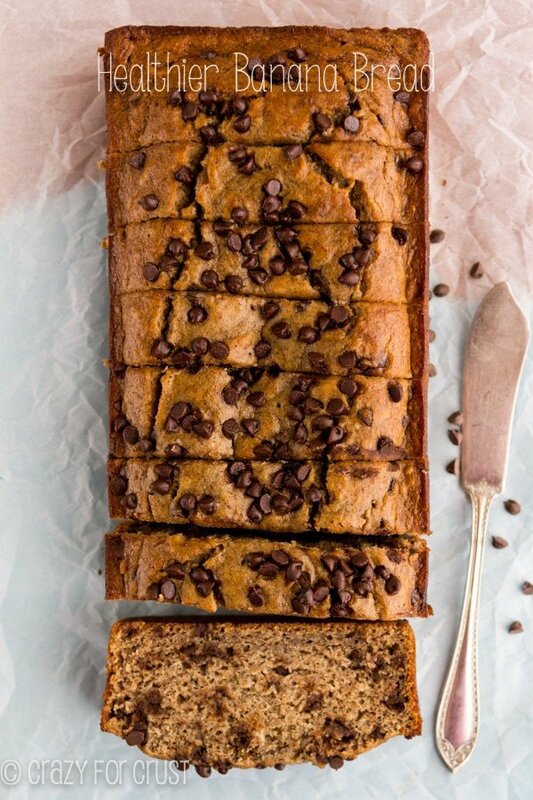 These bars are a cross between a granola bar and a banana bread/blondie. I actually combined my mom’s banana bread with my base blondie recipe to create something a little bit on the lighter side of both. I reduced the amount of butter and used oil instead. You can also use vegetable or coconut oil. Combined with 2 overripe bananas and an egg, you get a good bar base. A little brown sugar goes in for sweetening, and the binding is done with whole wheat flour and old fashioned oats. Yes, these have sugar and carbs. But even though my husband does whole 30/paleo, I don’t and I don’t think you come here expecting that. These bars are a great way to satisfy a little carb craving without breaking the bank. I mean…if I wasn’t trying to be good I’d reach for a doughnut or a scone. These are way better than that! By substituting butter for oil, I’ve made these a bit heart healthier. Vegetable oil is recognized as a healthier fat than butter by the American Heart Association. Using whole wheat flour makes these better than anything with white flour. The old fashioned oats give a nice texture. The bars you buy have a peanut butter drizzle, so I added that to these. You can skip, of course, or add some peanut butter chips or mini chocolate chips to the bars for extra flavor. They last about 2 days on the counter, or you can freeze them for a quick snack. That’s what I like to do, after my workout, with a cup of coffee and some apple slices. It gets me to lunch, where I’m not so hungry I eat the kitchen. An easy, fast, healthy breakfast or snack! 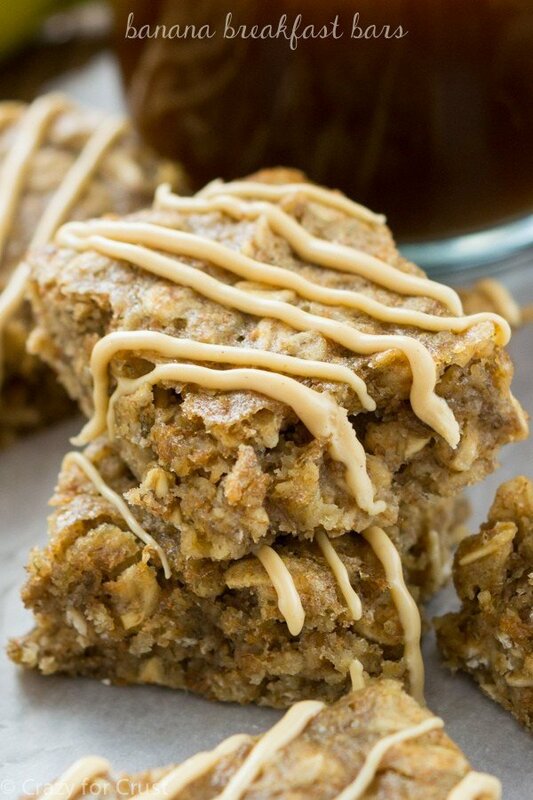 These banana breakfast bars are a cross between a granola bar and a banana blondie! Banana Breakfast Bars are an easy breakfast or snack with real ingredients and flavor. They're a copycat of the bars you buy, but homemade so they're better for you and cheaper too! Place bananas in a large bowl. Mash them with a fork or potato masher until just small chunks remain. Stir in oil and brown sugar with a wooden spoon or silicone spatula. Add egg, vanilla, and salt, and stir until combined. Stir in baking soda. Add flour and oats and stir until mixed, some lumps will remain. Spread in prepared pan. Bake for 18-22 minutes until browned around the edges and not jiggly in the center. Cool completely. Slice into bars. Optional drizzle: melt white chocolate chips and peanut butter in a small microwave safe bowl (on 50% power in 30 second increments, stirring between each). Place melted chocolate in a small ziploc bag with the tip cut off and drizzle over bars. Enjoy within 2 days or freeze for up to one month. I like to freeze them and then reheat as needed, since they don’t last very long on the counter. Hi Dorothy, these banana bars sound delicious!! Like you, I was eating lots of the store bought protein/granola bars until not long ago when I stopped as they’re processed with so many things in them I have no idea what they are! Thank you for this recipe! I hope to make it soon. Always need refueling after exercise too! Happy New Year to you and your family! Banana is one of my all time favorite breakfast flavors. These look like the perfect AM treat for me! These sound delicious ! Thank you for the motivational posts this year, they’re really helping me ! These are SOOOO delicious. Will be a go-to recipe for me. Always seem to have extra bananas lying around. 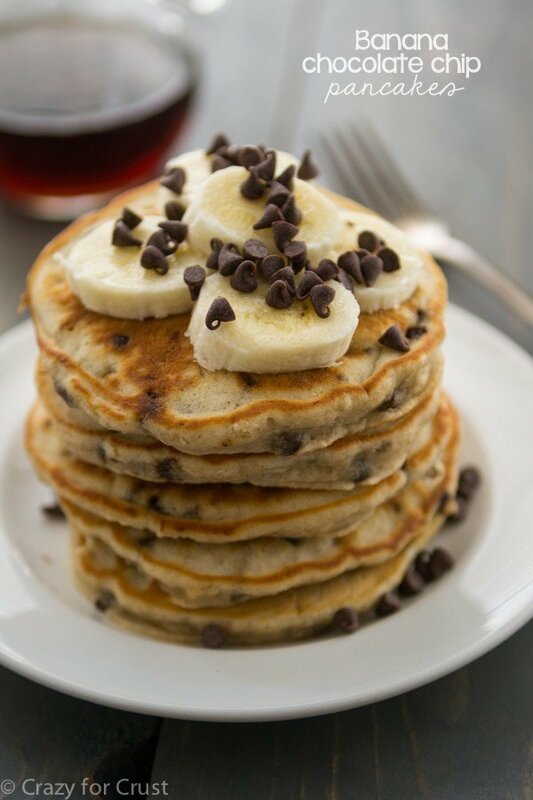 The perfect breakfast to help get you out of bed in morning. I made this a dubble batch I made this to be more paleo with more protein I used the coconut oil. the changes I made I used the same measurement of sugar substituting for coconut sugar, half the amount of flour, 1/8 cup chia seeds, and 1/8 heaping scoop of hempseed I baked it on a cookie sheet with parchment paper I baked it for about 25 minutes . It came out wonderful everyone enjoyed them. They came out great! I did add 1/2 teaspoon of cinnamon and I think it gave it a flavor that I personally love. Mine did come out a bit gooey but I think that’s because I mashed my bananas a lot more than I should’ve but it’s amazing. 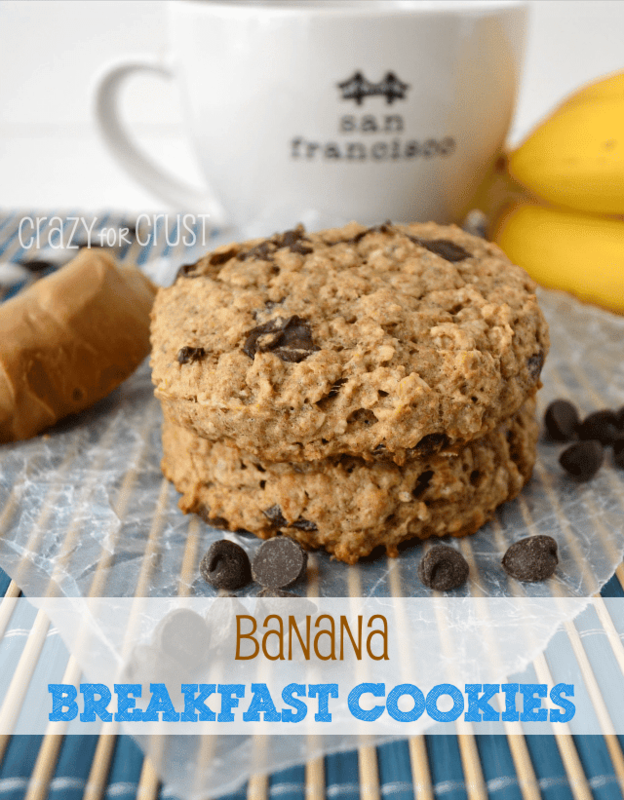 Great for breakfast or just a healthy snack. These are so moist and delicious. I add 1/4 Cup of peanut butter and an extra 1/4 Cup flour to the mix with some grated chocolate on top. Yum! Thanks for the recipe! I popped the recipe into a 12-cup muffin pan and they turned out great! Yum! These look so good! Do you think they would turn out okay if I substituted ground flaxseed for the egg?